Mr. Angel Gurría, Secretary-General of the OECD, was in Mexico on 10-11 October 2016 to present the OECD Review of Mexico's National Auditing System (read the Secretary-General's remarks in Spanish). While in Mexico, Mr. Gurría signed agreements with the Mexican Institute of Social Security (IMSS) to start new projects on regulation, integrity and public procurement. The Secretary-General also held bilateral meetings with several Mexican ministers and high-level authorities. 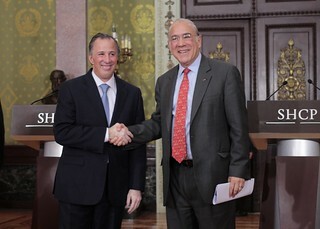 10 October 2016 (from left) - José Antonio Meade, Foreign Affairs Minister of Mexico, and Angel Gurría, OECD Secretary-General. Mexico D.F., Mexico.